External frames are an obvious upgrade from lopsided knapsacks, but if you’re not packing them properly, then you haven’t really made much of a change at all. There’s a method to this madness, and a way to pack them that utilizes every aspect of the frame. External frames help maintain your center of gravity, which sounds like hyperbole, but it’s actually how your body responds to specific pressure and weight in various areas. 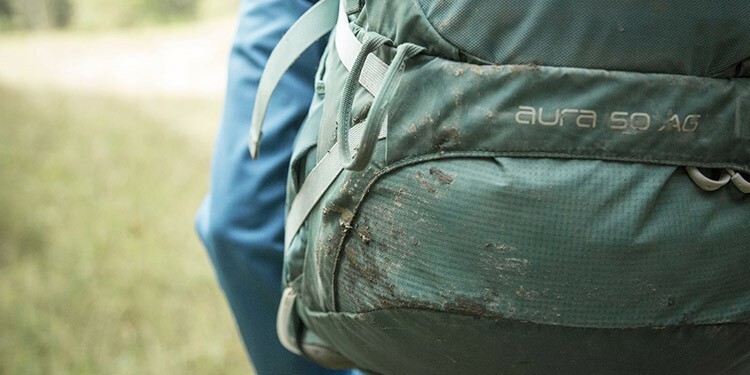 An external frame backpack allows you to carry more without damaging your lower lumbar, or having a sore back the minute you put the backpack down at your campsite. 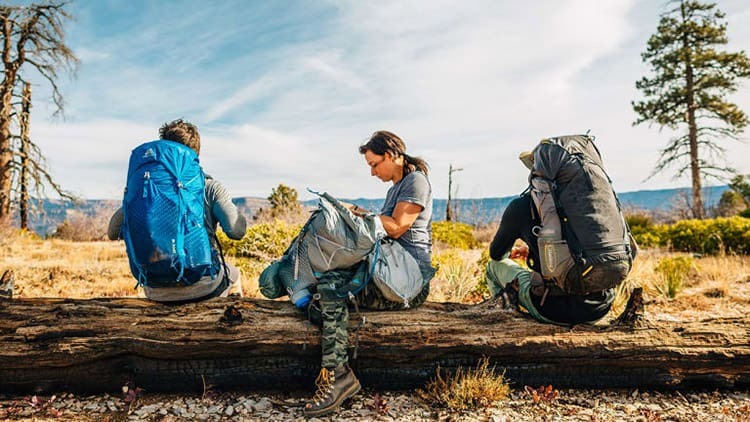 We’re going to go through five sequential steps of packing your external frame backpack, and after your second or third camping trip, this will be second nature to you. We want you to be fully prepared for every possible scenario, from your house until you set up camp, and back home again. Organize absolutely everything before you even look at your backpack. You’ll want to separate everything by weight, because your packing will half depend on the total weight of your items, and their individual weight to determine placement. Pair heavy items on one side of your surface, lightweight items on the other, and if you find that you have bulky, awkward-weighted items, pair those together as well. Now that everything is organized, it’s time to determine if that’s actually everything you need. Get a checklist and write down everything you should be bringing with you. You can use an app like Google Keep or Wunderlist to create a task list and edit it from time to time. You can even have friends and family (or anyone who will be accompanying you on your camping trip) added onto those notes, so they can add items to the checklist. Now use that with your organized pile, and see if you actually have everything you need. Make sure you’re not forgetting essentials, or that one specific item that your significant other asked you to include. Pack your sleeping bag before anything else. This seems a bit silly, but it’s going to help you in the long run. Even if you have an external frame backpack that can stand on its own when placed down vertically, your sleeping bag will not only help to keep it stiff, but you’ll be saving a ton of hassle later. When you pack your items (which we’re going to talk about next), the last thing you want to do is attach a bulky, rolled-up sleeping bag onto your packed bag. If you’re a minimalist camper and you’re not using a two-person or bulky sleeping bag, and perhaps you’re using a roll mat or a sleeping pad, you can fold these flat and place them on the inside of your bag beforehand. This is rather a rare occurrence since minimalists don’t tend to use external frame backpacks. Regardless of where it goes, put the sleeping bag in first. Start by putting in heavy, bulky items before anything else. You’re going to do this for two reasons. First of all, it’s difficult to place smaller items in the side pockets, only to have the bag go lopsided when you drop in a heavy item. Second, it lets you know how your bag will handle the weight distribution right away. Put in the heavy items, try to pick it up and maybe even wear it, and see how it feels. You’ll be doing this periodically throughout packing your backpack. You need to make sure those heavy items are crucial to setting up camp right away. We’re going to essentially organize these items as we go, so be certain that they aren’t immediately necessary to set up camp. These items go in the bottom of the main compartment, closer to the back panel. This all comes into play when we talk about your center of gravity, which is depending on you to place items strategically so you’re not toppling over from improper weight distribution. Now it’s time to start packing your lightweight, quick-access items. Things like your wallet, a fire starter, other camping gear and perhaps camping permits or any sort of paperwork you need, all in the side external pockets. This is a fairly straightforward step, but do keep in mind that these items are subject to environmental and shock damage more so than the items that are actually in your bag. Be wary when dropping this off your shoulders. It’s easy to forget that your sunglasses are in a small pocket when the pots and pans are in the bottom of the main compartment. If your external frame backpack comes with more exterior pockets than you need for quick-access items (phone, survival watch, etc. ), you can always use them during the next step. Lastly, you’re going to put campsite essential items near the top of the main compartment. As mentioned before, if you have extra external pockets, you can utilize these now as well. Your goal is to put your bag down, undo the top flap, and immediately have what you need to start setting up camp. The plan is to avoid dumping your contents in a big pile and sifting through them. You’ll not only avoid damaging your belongings, but you’ll be organized so you can start setting up camp in a sequential fashion. 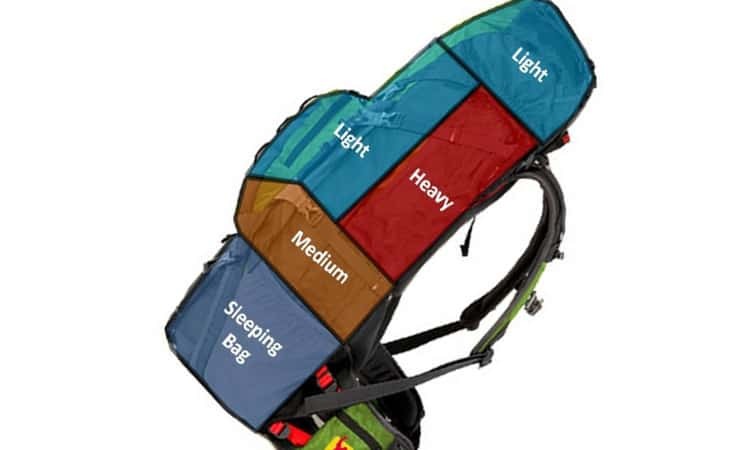 The top of the main compartment, the additional external pockets, and any additional bags that you’re carrying should be where you place your tent items, your fire starter to get a campfire going right away, fishing gear, survival EDC, food (especially for a long hike to a dispersed camping spot), and first-aid. 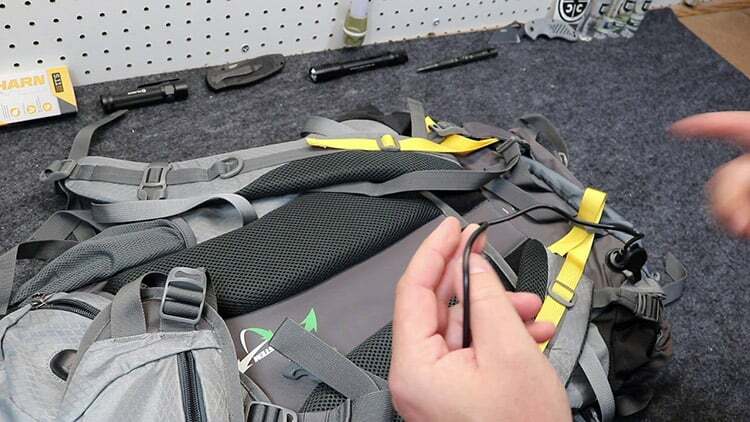 We have to think about the possibility of an injury or accident happening on the way in, so keeping this gear and quintessential tools like your survival knife and multitool handy is absolutely crucial to being prepared in any situation. 1. Your center of gravity defines everything. Too much weight up top, and your shoulders are going to suffer from it. Too much on the bottom, and you’ll feel it all in your back. The point of an external frame backpack is to evenly distribute weight, handle more than other bags can, simultaneously balancing your capabilities with the maximum capacity. 2. How well you pack it will determine how well it works. That means abiding by the previous tip on your center of gravity, but also packing individual items that distribute weight evenly across your back. If there’s a weight capacity for your bag (as would be listed by the manufacturer), try not to exceed 90% of the total allowance. While your bag can handle those weights, it’s generally not advised to push the limits and expend the durability of your backpack. Which you should do after every single trip, pay special attention to the frame. While it’s not common, improper handling and usage could lead to a rusted frame after a few rough trips. There’s a few things you can do to clean it and protect it properly. For one, don’t use abrasive materials like steel wool pads, even if there’s tough, stuck-on dirt. Try to stick to plastic bristle brushes or simple cotton cloths. Next, if applicable, and especially if you normally encounter rain when you camp, you should use a waterproofing spray to protect it for future use. It’s best to use this spray one to two days before your camping trip to get the full effect of it. After it dries, you shouldn’t need to bring it along with you at all. 4. You’ve got to give your back a break. Every twenty-or-so minutes, pull your backpack off your shoulders, and rest it down on the ground. Gently stretch by rolling your shoulders, and gently swing your arms around for about thirty seconds. This may not seem like much after your first stop, but if it’s an hour inland to the campsite, you’re going to feel sore and stiff without breaks. How do I Pack my External Frame Backpack When I’m Heading Home? This is the main problem with many guides found online, and we wanted to address it: they tell you how to get there, not how to get back. You should be able to get home in a quick and orderly fashion, and have as easy of a time hiking out as you did hiking in. If you followed your instructions properly and had your campsite essentials on the top of the kit, these will be the last things that you put back in. Grab your heavy gear and put that away first. If these are pots and pans, clean them immediately following breakfast so they can properly air dry. When it comes time to get your lightweight items together, it’s a great idea to organize them in an orderly fashion on the floor of your tent. If you’ve spent most of your camping life packing up by taking the tent down first, we’re about to rewire that idea. Heavy items in first, lightweight items organized in the tent so you pack things up back in order. Next, get yourself ready for the trip back. We often spend too much time packing up the site and pack away things like our wallet or paperwork that we might need when leaving a national park area or dispersed camping location. One tip we like to follow is to take a photo of your open backpack with your phone camera the minute you arrive, and then check to make sure you packed it properly by looking at that photo side-by-side with your departure packing. If you’ve done heavy items, light items, and your tent/campsite essentials on top, then it should look the same. When the tent comes down, that should be the very last signal that you’re done and ready to go home. External frames are superior to standard backpacks, especially models that remain erect when you place them down on the ground. One of the difficulties of your external frame backpack is that it’s an investment, just like a quality sleeping bag. We’ve developed a guide on how to effectively pack every sleeping bag style, which is especially useful if you’re storing it externally on your backpack.